As a seasoned parent and student counselor, Dr. Rick Horne understands the world in which teenagers live and the communication difficulty of talking to a disinterested and unmotivated teen. In Get Outta My Face, he combines biblical wisdom from the book of Proverbs with practical and specific directives that will make a difference in the life of you and your teen. Divided into three major sections, Part 1 addresses what you must understand to connect with your teen. 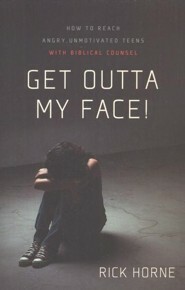 Part 2 tells you what you must do help your teen and Part 3 tells you how to make the changes stick. Paperback. Heres a fact. Angry, unmotivated, and disinterested teens, whether Christian or not, are confused, insecure, and often blind to everything except what they want right now. Their desires and actions have been corrupted and polluted by sin. Thats why they have a problem. Heres another fact. Angry, unmotivated, and disinterested teens, whether Christian or not, are made in the image of God. This means that beneath their corrupted desires and actions the image of God remains. Thats the key to solving their problem. How to talk effectively to an angry, disinterested, or unmotivated teen (who usually doesnt want to talk to you). How to nurture this young persons willingness to make better choices (when he or she often doesnt think that other options make any sense). How to restore a rich relationship (when both adult and teen may have given up hope that the relationship can get better). I'm the author/artist and I want to review Get Outta My Face! : How to Reach Angry, Unmotivated Teens with Biblical Counsel - eBook.